This was left-over in my sketch book from the summer and I thought I'd colour it and sub it on Threadless. 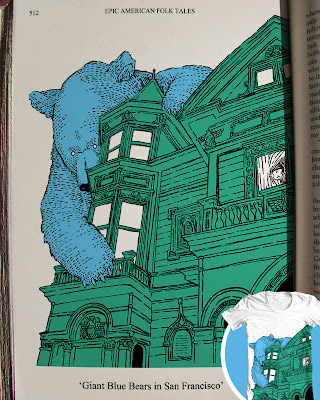 As with the other spirit bear illustrations it really lends itself to being on the printed page (as my mocked up presentation suggests) rather than on a t-shirt. Hint, hint. Someone offer me a book deal please. I'm not crazy about over-sized prints either but the illustration didn't really give me much option and I think the big slabs of colour sort of work in this instance. Votes and comments are more than welcome - click here for more. "This gentle giant is inadvertently scaring all the children in the Haight/Ashbury area of San Francisco. He doesn't mean to but he's a curious brute. Besides it's Halloween - the kids like a little scaring this time of year."